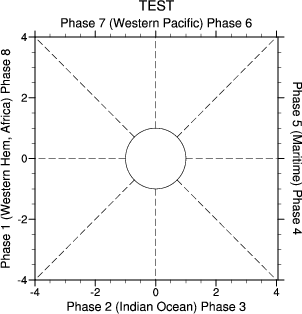 Plot background for MJO phase-space diagram. An NCL Workstation identifier. The identifier is one returned either from calling gsn_open_wks or calling create to create a Workstation object. opt@tiMainString: If present, this specifies the title associated with the background plot. opt@radius - If opt=True and this attribute is present, then this attribute will specify the radius of the inner circle. The first graphic generated may be seen here. The second graphic is here.